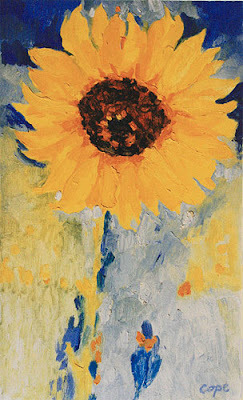 Sunflowers circa 1997 – Van Gogh 1889 – Who ‘owns’ subject matter? It’s a kind of painting that rather changes in character, and takes on a richness the longer you look at it (are you paying attention , you who bounce out of this site in less than ten seconds?). I’m painting sunflowers again, after a lapse of ten years. I do love them, their bright glad happy faces. Heraldic of the South & of rustic, peasant culture (actually, here in the Dordogne, in a chateau, there’s a Renaissance ‘meditation’ painted cabinet, which has a startling sixteenth century image of a classical god with a sunflower as a head. 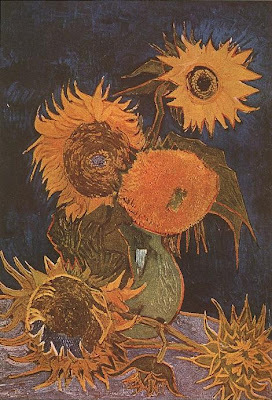 So there was a time when sunflowers did indeed have another signification than the current post-Van Gogh icongraphy). So, of course, it’s Vincent again. I’m happy with that, as I feel OK with his influence. But who really owns subject matter? I remember ten years ago, I was living in a house which was surrounded on three sides by vast fields of sunflowers. I was painting for a show in The Richmond Hill Gallery, London. I’d come from an intensely urban, inner city life in Bristol, groovy, comtemporary & hip. Northern European. Not Southern. I was adapting to my new life in SW France. At the time, I part of me felt it was naff to paint flowers. Clichés. Painted so many times as to provoke blindness. That Blindness call ART or just another picture. Done to death in the amateur painting circles. Vincent writes above about the sunflowers are ‘his’. And of course they are. 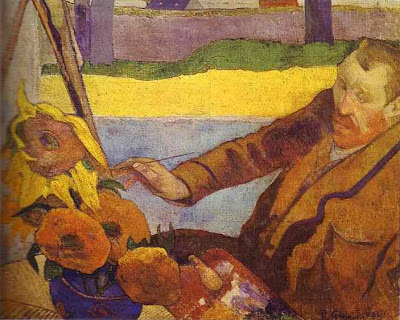 To paint sunflowers is to be compared with Vincent. 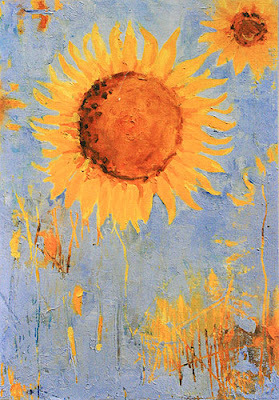 And that’s OK.
Funnily enough at the same time, across the fields of sunflowers, there lived another English painter. Peter Morrell, a retired Lecturer of Painting from St Martins School of Art, London. He had many years of disciplined painting under his belt & influenced me somewhat at the time. I was then painting alot of still-lives. Flowers. Fruits. Market day succulence. Mostly peaches & apricots & plums & pears. After a few visits to my studio, he then started to paint peaches & apricots & plums & pears as well (previously he had made something of a reputation amongst fellow artists in London for his black bananas, as they’d blacken before he’d finished painting them). One day he came into my studio & said “You know Adam, nobody owns a subject matter.” And of course he was right. Something when painted often enough by many painters becomes a genre. It develops a ‘cannon’, interpretations, variations on a theme. And lesser painters will always be compared to greater painters. And the first to do it is not necessarily the painter to get the credit either. Nor is the painter who is associated with a certain subject matter necessarily the painter who does it the best. Fear of influence? Phlagarism? Pastiche? 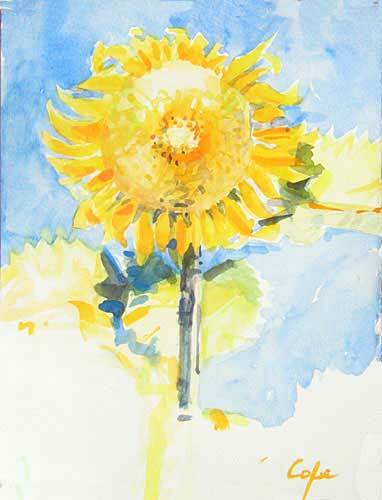 Ten years on, and I’m painting sunflowers again (see next posting: Sunflowers – The Last of The Stragglers).